New gameplay videos ahead of this month's release. Sega has announced that Bonus Stages and Time Attack Mode will be a feature in Sonic Mania, as well as revealed new details about the previously announced Special Stages. Bonus Stages – In “Blue Spheres”, players navigate Sonic, Tails, or Knuckles through a series of blue spheres to clear the stage. But be careful! Once touched, the blue spheres will turn red. Touching a red sphere instantly ends the Bonus Stage. Silver Medallions are awarded to players who complete the Bonus Stage, while collecting all the blue spheres and rings awards players with a perfect score and a Gold Medallion. Time Attack – Prove you’re the best of the best in Time Attack, which lets players compete for fastest speed in the world by recording their time in the game’s online leaderboard. 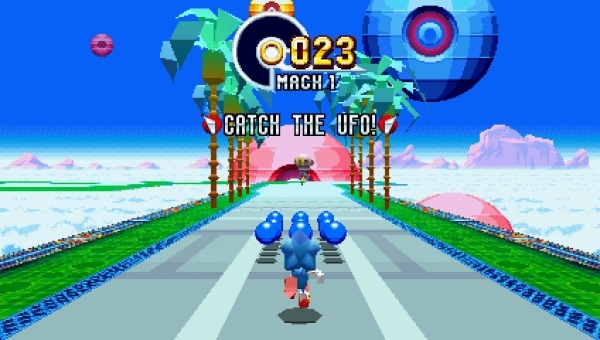 Special Stages – Players chase down enemy UFOs to secure various Chaos Emeralds. Collecting blue spheres along the way will give their character an added boost of speed to their meter. Once the meter fills up, the Mach level increases. Just watch out and don’t speed off the stage! Sonic Mania is due out digitally for PlayStation 4, Xbox One, Switch, and PC on August 15. Watch a set of gameplay videos below. View a set of screenshots at the gallery.